It's been a while since I've offered a giveaway, but the wait was worth it. I've been a big fan of Tate's Bake Shop's gluten-free chocolate chip cookies since I discovered them a few years ago; they're thin and crunchy with large chocolate morsels studded throughout each and every one. 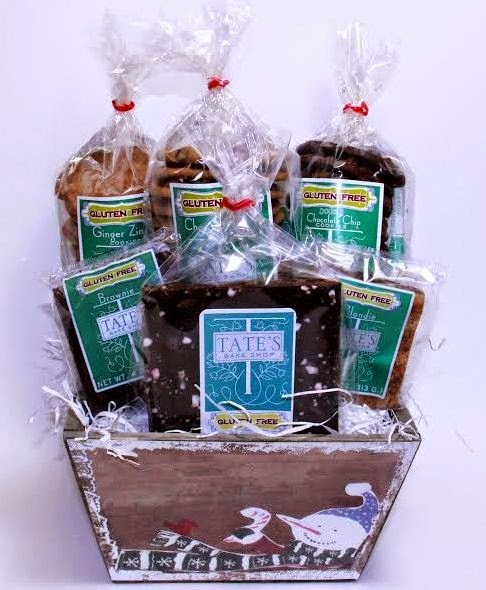 Tate's sent me a gluten-free holiday gift basket so that the Gluten Free Philly family could try some of their newer all-natural products like the Chocolate Chip Cookie Peppermint Bark and Double Chocolate Chip Cookies. (Tate's gluten-free products are made in a dedicated facility.) Amazingly, the "chocolate" chocolate chip cookies are even better than the original. I'm not a huge fan of ginger, but even the Ginger Zinger cookies were tasty. I love chocolate peppermint bark, and when you add in cookies? Sheer bliss, my friends. To enter up to three different ways, follow the instructions below. Entries are being accepted through midnight Eastern on Monday, December 1. The winner will need to respond to a notification email and provide a U.S. mailing address. Good luck! DISCLOSURE: While Tate's Bake Shop provided product samples for me to review at no cost, such compensation did not influence my review. Neither I am nor any immediate family member is an employee, officer, director or agent of Tate's or its respective parent, subsidiary and affiliated entities, advertising and promotional agencies. This post contains affiliate links. Click here for my complete Disclosure. Would love to try something beau don't have to make! Especially cookies! Oh tough choice...the ginger zinger... No wait the Blondie... Wait I forgot about the peppermint bark! I would love to try the blondies. I have tried the cookies and they're great. I am most excited to try the Gluten-Free Chocolate Chip Cookie Peppermint Bark. I love their cookies, they are really good. Even my non gluten free co-workers eat them when I bring them in. Would love to give this to my GF Hubby! My baking is sub-par, but Tate's are SOOOOO GOOOD! Would love to try everything, but the blondies sound particularly amazing! I'd love to try any of them! But I've been searching for a good ginger cookie.... Also thanks for all you do! This site has become a lifeline for me. The chocolate chip cookies are awesome, but I'm curious about the peppermint bark! Their chocolate chip cookies are perfection! Crunchy, buttery and chock full of chips!!! Can't wait to try the peppermint bark. Yum! I would love to try the ginger zinger!! One of my old favorites are ginger snaps! I am so excited about the Peppermint Bark! Oh those ginger zingers sound scrumptious! I think the Ginger Zinger cookies sounds delightful. Plus, they are such fun to talk about! Would love to try the Blondie. ..absolutely love their chocolate chip cookies! I love the Ginger Zinger cookies. Nice pop of ginger. The Chocolate chocolate chip sound amazing! Everything looks amazing. The ginger zingers sound perfect for the season. Gluten-Free Chocolate Chip Cookie Peppermint Bark sounds so good! The gluten free blondie sounds amazing! I love the chocolate chip cookies, I can't wait to try the peppermint bark, yum! Wow, peppermint bark and ginger cookies! Sounds great! !